Abstract: The first thing I noticed about the monitor was the size, with dimensions of 468x492x483.2 mm, the 900IFT isn't a small monitor and I had to rearrange the test bench a bit so the 900IFT would fit. 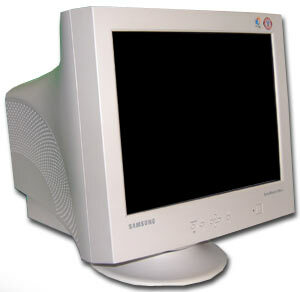 With a price tag of $520 CDN ($350 US), the Samsung SyncMaster 900IFT is not expensive, but it's not cheap for a 19" CRT either. The first thing I noticed about the monitor was the size, with dimensions of 468x492x483.2 mm, the 900IFT isn't a small monitor and I had to rearrange the test bench a bit so the 900IFT would fit. Built using Samsung's DynaFlat technology, the actual dot mask is curved both on the horizontal and vertical axis. On the IFT series of monitors this curvature is very slight and almost unnoticeable but it is there, however it's not as obvious as with Samsung's Syncmaster DF's series of monitors. It was very nice to see that Samsung kept the bezel of the monitor clean and free of gimmicks unlike some of it's competitors. The controls were easily accessible from the from bezel just under the screen and the menu's are easy to use and pretty much self explanatory. The maximum resolution of the 900IFT is 1600x1200 with a refresh rate of 75 Hz which is very respectable for a 19" monitor. Since the 900IFT is a CRT monitor, it uses the 15-pin analog VGA connector only. It was interesting to see an USB B port on the back of the monitor, we're not really sure what it's for since there is no USB hub anywhere on the monitor. There is a slot in the back of the based that allows you to install a proprietary USB hub.One thing taken for granted by most users is the ability for a monitor to swivel. It was nice to see that the 900IFT could be easily adjusted be it to face left, right, up or down. The 900IFT also has 205 MHz of bandwidth available.